College algebra teachers! Please try this and report back! My fellow teachers of College Algebra. I want to talk to you today about domain and range. For now, let’s leave aside all the analogies, vending machines, notation and ants crawling on graphs. Let’s get to the heart of the matter with an assessment/instructional task. This is in the spirit of Eric Mazur, but it is low-technology. It will take 10 minutes. Then you’ll need to report your results back to me. We can talk about what those results mean. Get yourself a College Algebra class that has studying (or even one that is still studying) domain and range. 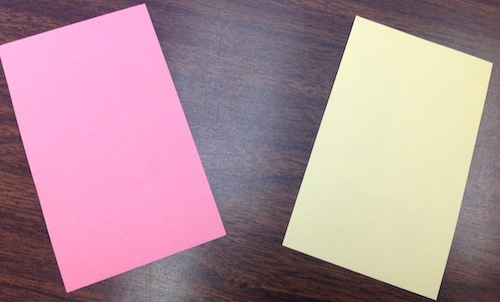 Then get yourself some index cards in two colors. We used yellow and pink. You may use whatever you have on hand. Make clear that yellow means yes, and that pink means no. Also make clear that they will raise their cards in unison and on the count of 3. This is to prevent conforming to the majority and will result in more honest representations of your students’ understanding. Practice this routine on some non-mathematical questions. Some that will be universal nos, some universal yeses, some that are mixed. Now have your students consider the function , where x is interpreted as the input, and y as the output in the usual way. You are going to ask a series of questions about the range of this function. Ask, Is 4 in the range of this function? You should get near universal yellow. Ask someone to state the case and make a note of their argument on the board. Ask, Is –2 in the range of this function? My bet is that you’ll have a lot of pinks, but several yellows. Those yellows probably need clarification that we are asking about range, not domain. But don’t assume it. Ask the pinks to state their case. Ask the yellows to refute or question. Never say anything a [student] can say. You will probably need to revisit this later on. Ask, Is in the range of this function? This is probably all yellow and mostly unproblematic. Ask, Is π in the range of this function? If you don’t get a good mix of yellow and pink here, I will eat my hat. And those pink people? They are going to tell you that there is nothing that—when squared—gives π. Have them talk it out in pairs or threes. Then have them show cards again. And then have the pinks state their case. Nine times out of ten, it’s going to be that there is no number that can be squared to get π. My fellow College Algebra teachers, I am not interested in your theoretical arguments about what a fabulous job you/your textbook/your online homework platform are doing at teaching domain and range. If you wish to claim that your students will not show pink for π here, the burden of proof on you is high. Someone will point out that is a number, and that when you square it you get π. Highlight that contribution and estimate the value of this number. Ask, Is 0 in the range of this function? Probably mostly yellow, but worth asking to make sure. Ask, Is infinity in the range of this function? Reinforce that infinity is not a number. Connect it to the notation and wrap up with one more. Ask, Is 12 in the range of this function? You should get nearly all yellow here. Get back to your regularly scheduled classroom activities. Then report and discuss your results with colleagues, on Twitter, on your blog and here. There is lots of unexpected pushback in the comments on the value of teaching domain, range and functions in a College Algebra course. I had previously thought these to be de rigueur topics in such a course. I suspect sampling bias here. Gregory Taylor mostly reproduced my results in his own course and had some lovely mathematical conversations along the way. You should go read his account. Holy cow, this was a lot of work. Thanks to all who sent along testimonials to my service. Really, really helpful. And you can read it here if you like. I cannot imagine why you would unless, like my dean, you have to. But you can. Comments welcome. Time for a public confession. One of my favorite parts of my hard copy of the Sunday New York Times each week is the Business section. Ordinarily this has nothing to do with my job. It’s just a brief trip into a fantasy world in which I earn real money; a chance to bump elbows with people who do. But this week there were three articles about badges. Exhibit A: Natasha Singer’s “Slipstream” column. This covers the online trend of virtual rewards, referred to as gamification and reminds us that there may be danger in allowing ourselves to be manipulated. There is discussion of the Twitter badge on Samsung’s site, a company called Badgeville that designs game-based sites, and the difference between virtual rewards (badges) and real ones (free airplane trips). Exhibit B: Randall Stross’s “Digital Domain” column. This covers a medical social networking site that allows patients to ask question and doctors to post and discuss answers to those questions. There are the Paramedic Award, the Good Samaritan Award, the Louis Pasteur Award and many others. Right. When the rewards are extrinsic (can you say “badges” or “test scores”? ), those who buy in become motivated for the reward. I don’t work for badges. Or grades. Or external evaluations of any kind, really. Of course this meant a lot of B’s and C’s in high school and much teacher and parental hand-wringing about “underachievement”. And it meant quitting the Boy Scouts after my first year because I was uninterested in earning literal badges. Now I’m supposed to be interested in your virtual badges? So teachers, let’s be careful about this stuff. Best case scenario in the long term seems to be annoying kids with this stuff. Worst case scenario reduces their interest in what we’re trying to motivate them to do. Those aren’t numbers, so don’t treat them as though they were! So you’re a teacher. You’ve read here and there on the web and you’ve decided it’s time to go standards-based w/r/t your grading. You’re thinking a 0-4 rubric is the way to go. You’ve given names to your categories. Or some such. In any case, you’re likely thinking of both 3 and 4 as pretty good. You’d be happy if all of your students were at the 3 or 4 level on a regular basis. But 2 isn’t a train wreck; kids scoring at the 2 level are making progress, but not the kind of progress you hope for. Your students scoring at the 1 level are in trouble, but not your 2’s. This is all going well in your classroom. The holistic scoring is focusing your assessment efforts like never before. You’re able to have more meaningful conversations with students and their parents about student progress. You no longer debate missed minus signs and whether they are worth deducting half a point or a whole point. Grade-grubbing is a thing of the past in your classroom. Etc. And now it’s time to figure grades. And now your proficient kids are getting C’s and your beginners are failing. What do you do about this? You could readjust your grading scale. But really? You’re gonna tell parents that 50% is passing in your class? That’s not gonna fly in most circumstances. No, you need to change your thinking about that rubric. That 0-4 grading scale? It’s not made up of numbers, my friend. It’s made up of categories. Pegasus is Pegasus/Unicorn What percent is that? 4 means accomplished. I would like to assign this score the grade of A. So each score of 4 will be worth 100% of the points available. 3 means proficient. I would like to assign this score the grade of B. So each score of 3 will be worth 85% of the points available. 2 means beginning. I would like to assign this score the grade of C. So each score of 2 will be worth 75% of the points available. 1 means struggling. I would like to assign this score the grade of D. So each score of 1 will be worth 65% of the points available. 0 means missing. I will assign 0% of the available points to this score. Adjust to fit (1) whatever the operative percentage scale is in your school culture, and (2) whatever correspondence you would like to create between the score and the grade. Same philosophy for 0-5 rubrics, etc. The point is that we need to be explicit with our students and with ourselves about the meaning we intend to assign each category in our rubric, and about the meaning we intend to communicate through our grades. 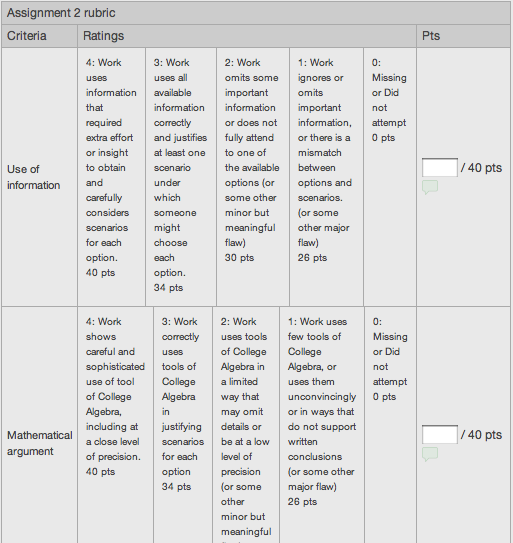 A sample rubric using the system described. The assignment is worth 80 points. But whatever you do, you’ve gotta stop treating ordinal scales as though they were ratio measurements. My analogy is that I’m throwing darts at a target trying to hit it but I have no idea where the target is. Because unless you help the student to figure out how to make their thinking visible to you, you just keep giving reading lessons aimlessly throwing these darts out hoping you meet the target. So this research is an attempt to figure out where the target is.